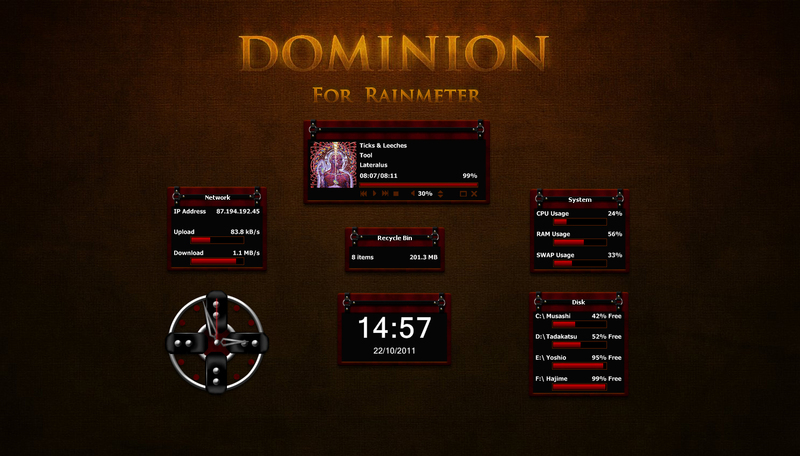 Dominion Rainmeter to compliment the Dominion Windowblind by Master Skinner Xiandi. Many thanks to Xiandi for permission and source material, and WebGizmos for permission to use the .png files from his Dominion Xtreme theme. Thanks also to Poiru and Marc 22. Next time, please do not include a preview of the skin/theme or other unnecessary files. This is cool Starcandy. I especially like the clock. Why to go Helen. Great work. top or bottom, entertaining concept, looks good. A very nice addition to the theme Starcandy and thank you very much for sharing. I've added your skin with a link to the Suite description. Thank you, Philly. I certainly didn't expect that. Woohoo! Next time, please do not include a preview of the skin/theme or other unnecessary files. (PS. : Ratings/comments added -prior- to moderator aprovement have been removed) Keep up the great work! That explains why Xiandi and my comments aren't here anymore. For a first skin, it looks fantastic, Starcandy. I are so jealous. Just kidding. Love your first Starcandy. Can't wait to see some more. Thank you LadyShrike1, but Xiandi and WebGizmos did the hard work. Thank you, Uvah. Hope to upload more soon. Thank you LadyShrike1, but Xiandi and WebGizmos did the hard work. Thank you, Uvah. Hope to upload more soon. I know better. I've been pushing other's pixels for a long while now, and it is work. You do it well. I think you did a very awesome job and I hope to see much more. WOW! 1st skin and it's rainmeter! You did an excellent job, looks and works great! You did an awesome job Helen! Thank you! I really really love that clock too! Boy that is nice. Very good work and it's your first too!